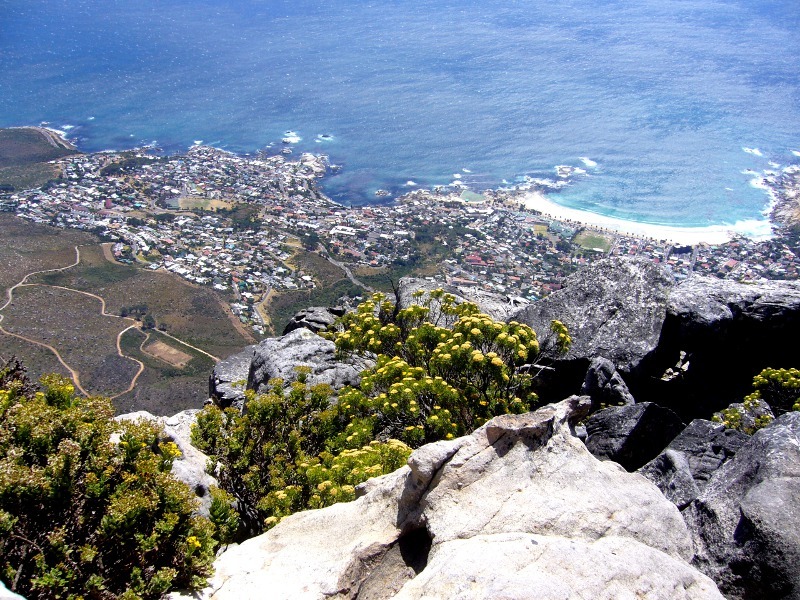 Cape Town is a nature lover’s dream destination. Not only is it bestowed with beautiful mountains and deep, blue seas, it also has man-made attractions that rival Mother Nature’s own creations. 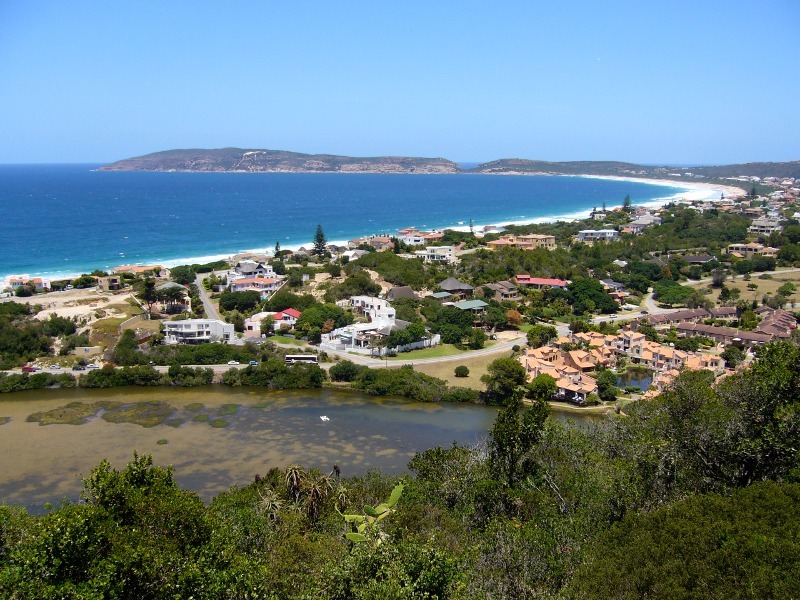 The best part is a road trip down the Garden Route, a tourist corridor that traces the scenic coastline of South Africa’s Western Cape. DAY 1. We were welcomed to Cape Town by a cool sea breeze the moment we stepped out of the airport. It put a smile on our faces and signalled a perfect start to our year-end holiday. My friend and I had made the 12-hour journey from Singapore at the invitation of an old classmate stationed there. Even though it was summer, the temperature in Cape Town was relatively cool, peaking at an average maximum of 26°C only. Sunny days are aplenty here and today was one of them, as we drove to Camps Bay for lunch. 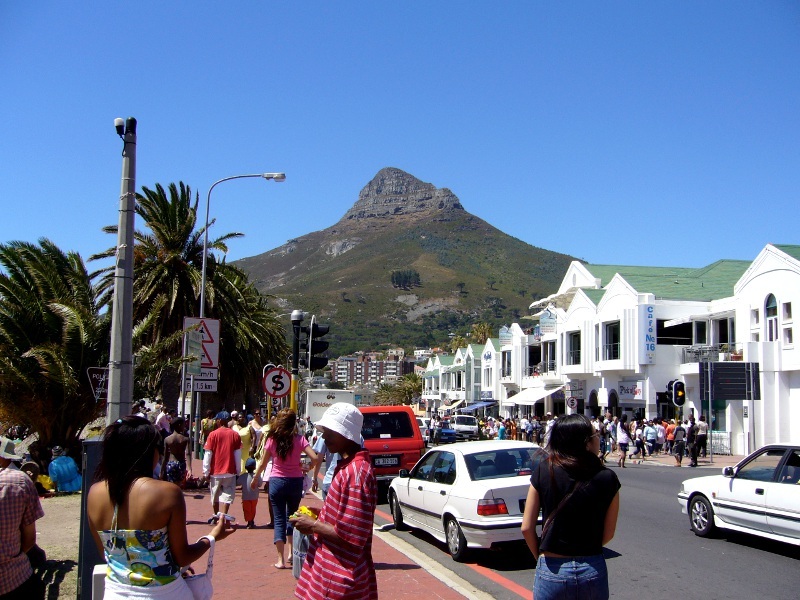 Nestled beneath Lions Head and the Twelve Apostles, Camps Bay is a vibrant beachfront lined with cafes and restaurants. A 15-minute drive from the city, it is one of Cape Town’s most popular beaches, bubbling with activities throughout the year. 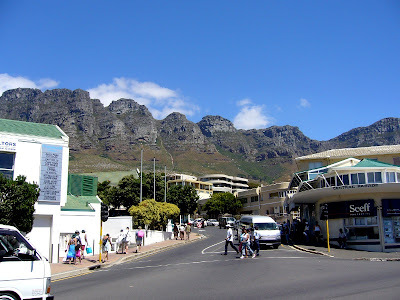 The Twelve Apostles, a series of buttresses on the west flank of Table Mountain behind Camps Bay. 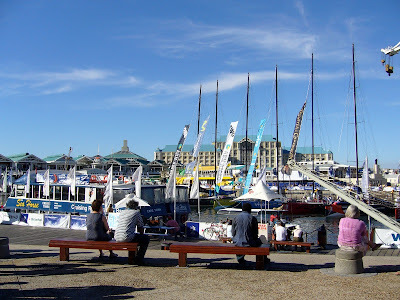 After lunch, we headed to another of Cape Town’s biggest tourist attraction, the Victoria & Alfred Waterfront. 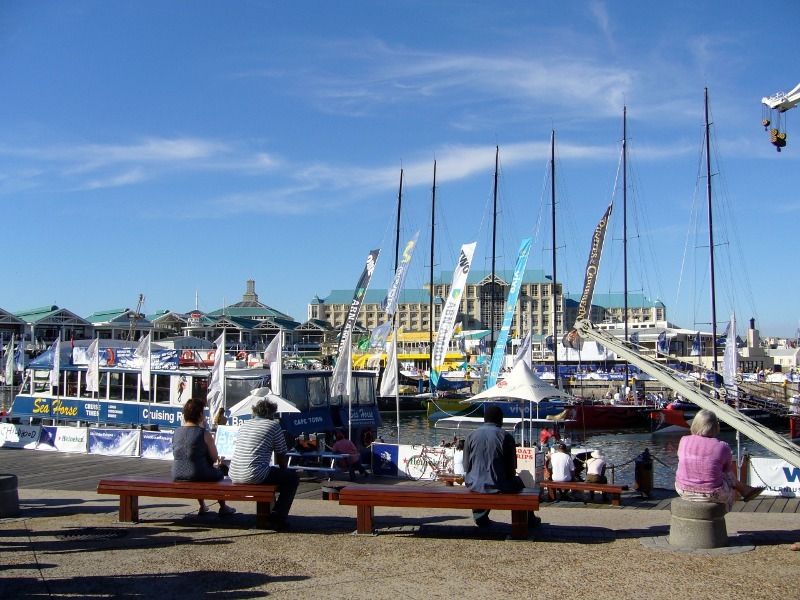 A working harbour, the Waterfront (as it is called in short) incorporates in one location the central shopping area of the city, exciting food and beverage venues, an awesome aquarium and the Nelson Mandela Gateway, the departure point for tours to Robben Island. 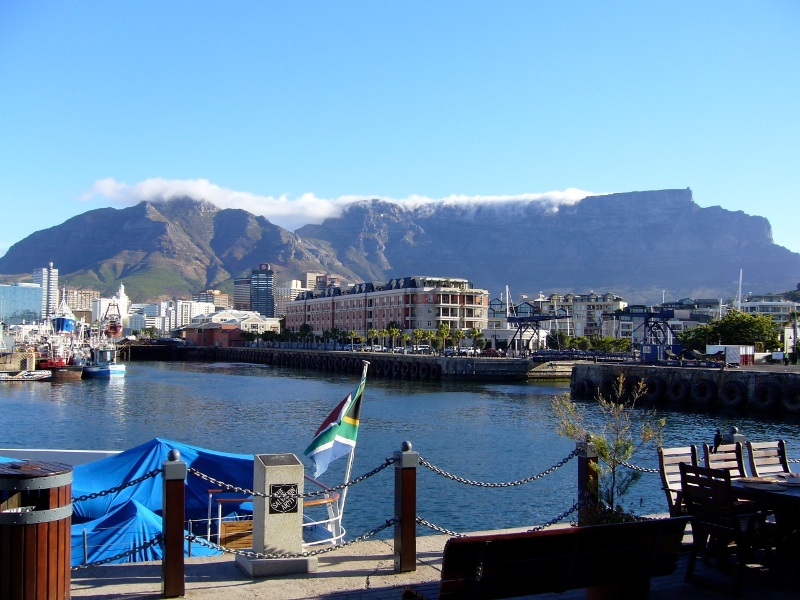 Besides its great entertainment value, the scenery value of the Waterfront is no less inferior, with the magnificence of Table Mountain forming its backdrop. Stunning view of Table Mountain from the Waterfront. DAY 2. 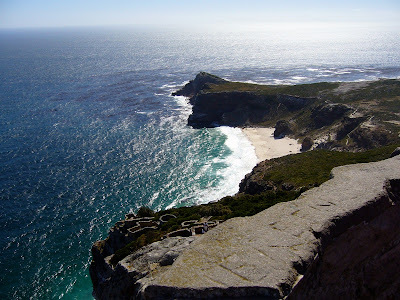 Today we joined a day tour to explore the sights of the Cape Peninsula. 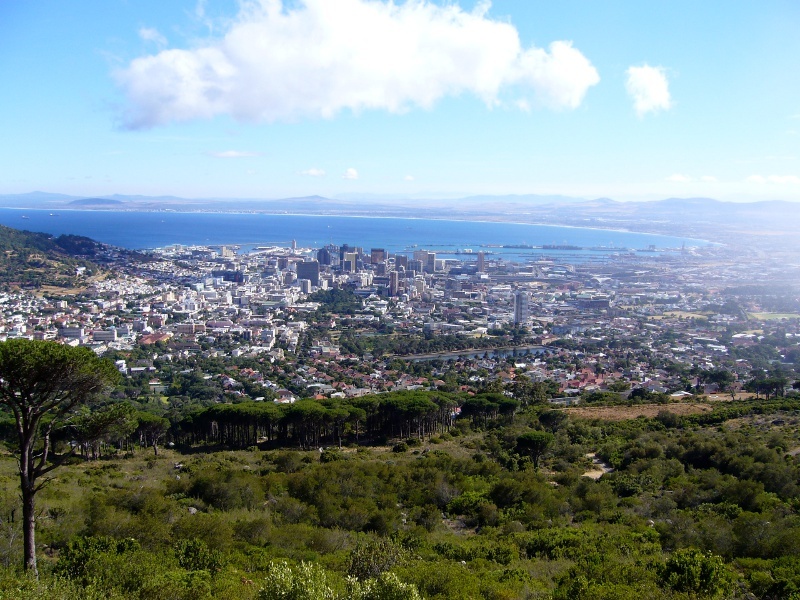 This is the essential tour to take if you have only one precious day in Cape Town. 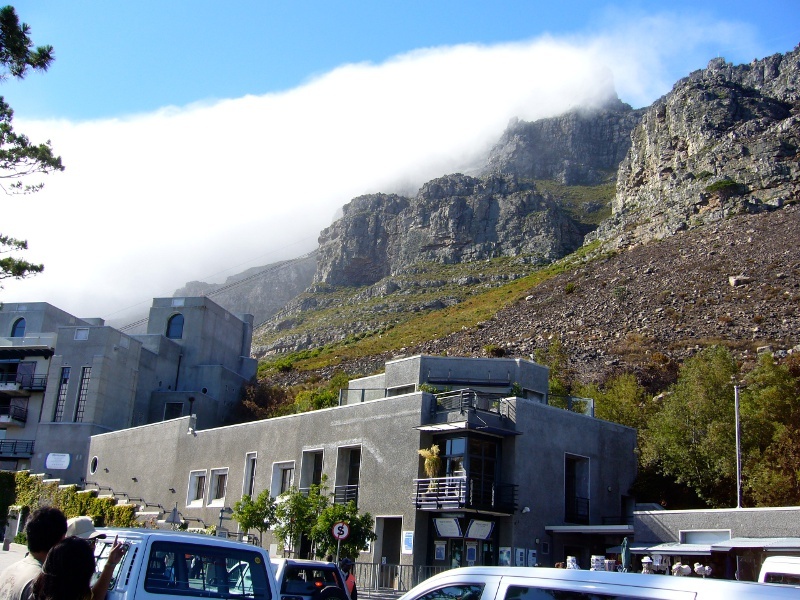 First stop, the “number one must-see” attraction in Cape Town, Table Mountain. 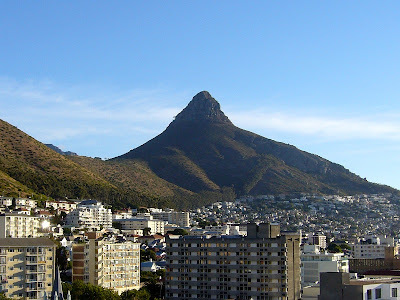 Table Mountain is a 1,087m-high flat-topped ridge with steep cliffs and eroded gorges. Also known as Hoerikwaggo (mountain of the sea) to the indigenous people, it did not start off as being flat, but only became so after years of erosion. 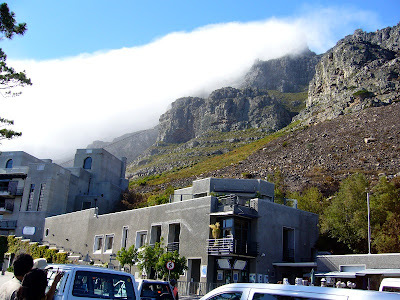 One of the highlights associated with Table Mountain is the famous Table Cloth, a layer of cloud cover that tumbles over the north face of the mountain so magnificently. 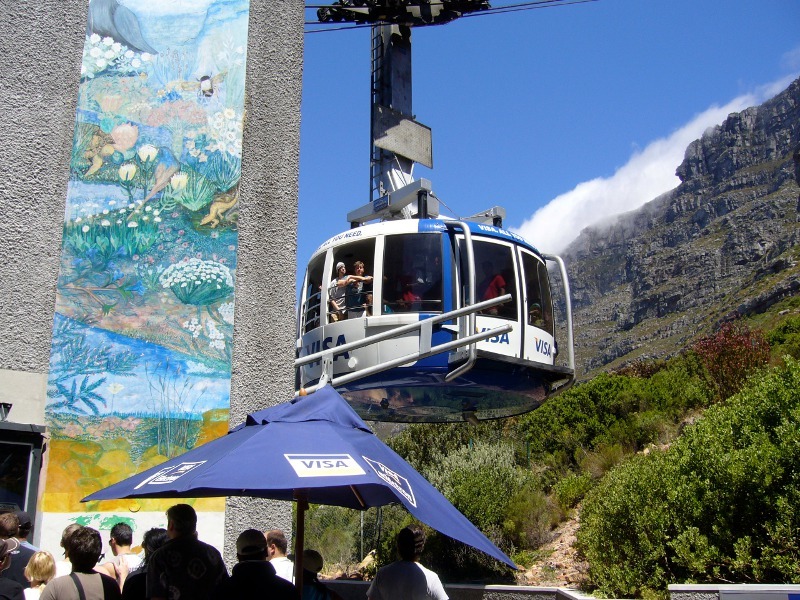 It is also this phenomenon that makes it a hit-and-miss when attempting to ascend the mountain, for when the winds are dangerously strong, the summit and cableway are closed. We only managed to head up on our second try and stayed just long enough before the peak was closed to visitors. But once you have obtained your ticket up, the views from the summit are phenomenal. The ride in the revolving cable car itself is already half the fun and once out of the cable car, the first thing that strikes you is the wind. Forget about your caps, hats or hairspray, nothing can withstand the gale-force wind coming at you up there. It is very refreshing though, to just stand there and enjoy the wind while admiring the view. 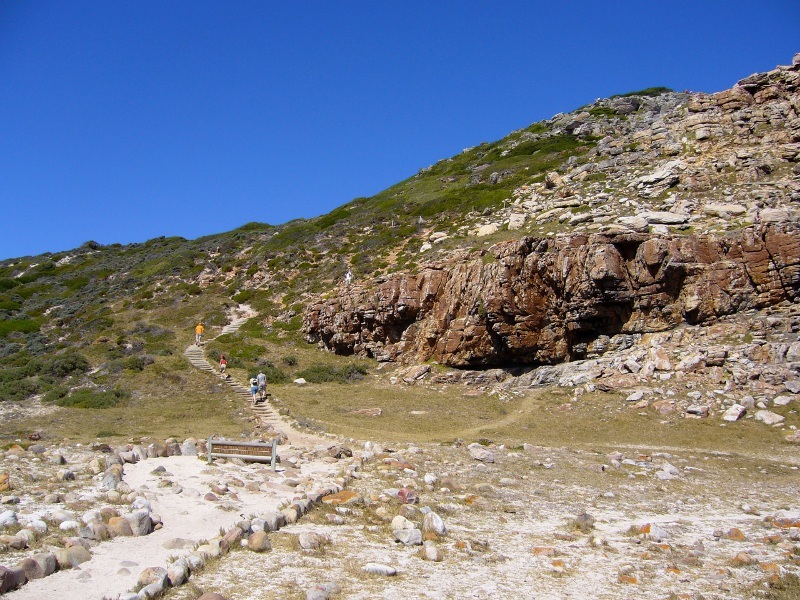 There are also a number of easy trails to attempt on the summit, for it is flat-topped after all. And if the wind is really getting to you, you can duck into the café or souvenir shop for cover. The view of Cape Town from the base station of Table Mountain. Looking up towards the summit from the base of Table Mountain. 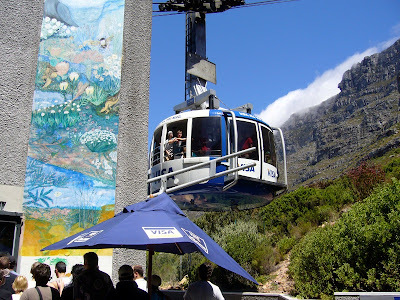 The revolving cable car that brings visitors to the summit of Table Mountain. Looking down at the city from the summit of Table Mountain. Next stop on the tour was Hout Bay, a 20-minute drive from Cape Town. Formerly a fishing village, Hout Bay is a popular destination for locals and visitors alike today. You can grab a bite of fish & chips while enjoying the scenery or take a boat ride out to Duiker Island (Seal Island) to catch sight of the resident Cape Fur Seals that call the harbour home. But remember to hold your breath though, for a congregation of many such seals does not smell nice at all. 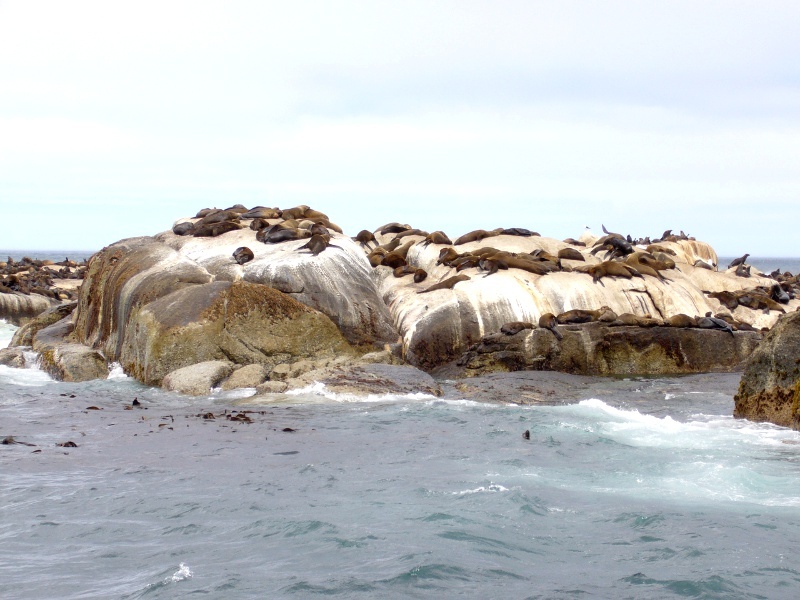 Cape Fur Seals lounging on the rocks of Duiker Island. 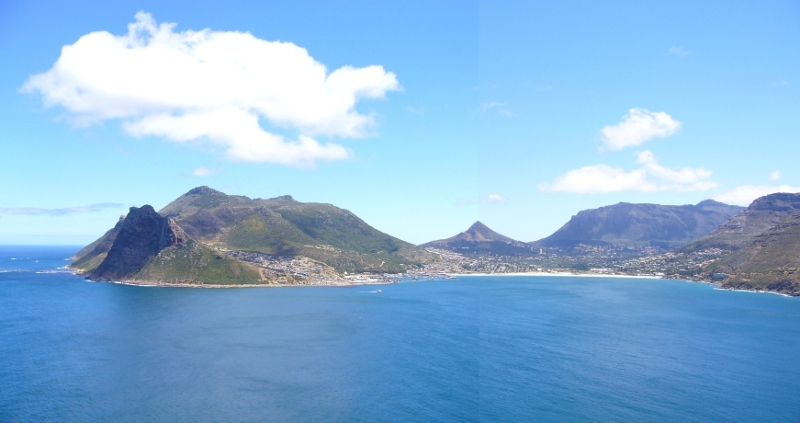 Hout Bay, as seen from the opposite shore along Chapman’s Peak Drive. 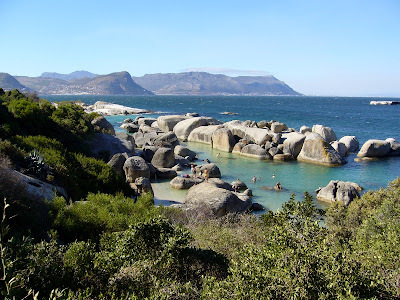 After a lunch stopover at Simon’s Town, a delightful little seaside village, we travelled another 3km south to reach Boulders Beach, a picturesque beachfront with large boulders where the sea is calm and the little shallow coves make it popular for families during the weekends. But rocks aside, the main attraction at Boulders Beach is the some 3000 “Jackass” African penguins that roam the beach. 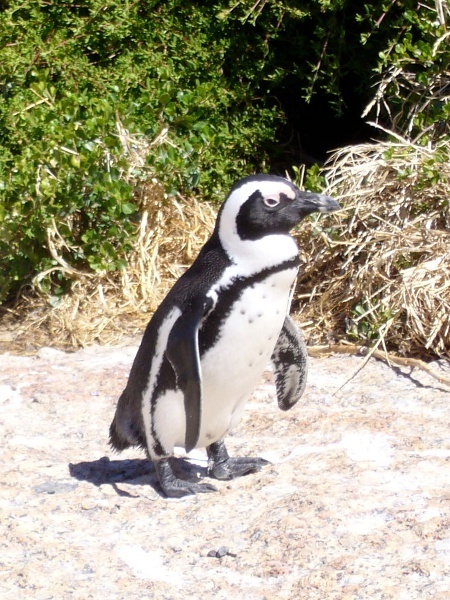 It is one of the only two mainland African penguin colonies in the world. 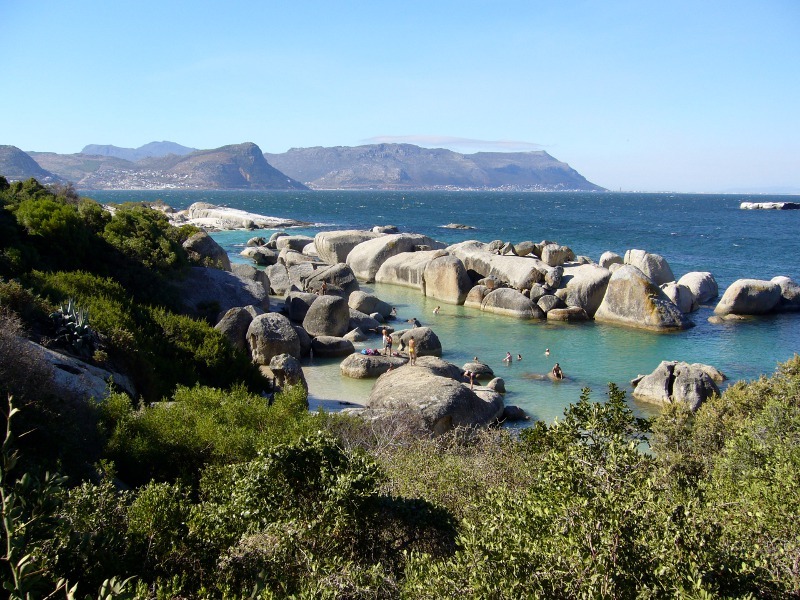 The picturesque beachfront of Boulders Beach. 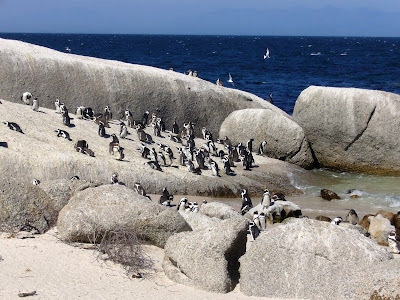 The African Penguin Colony at Boulders Beach. An African penguin enjoying the afternoon sun. 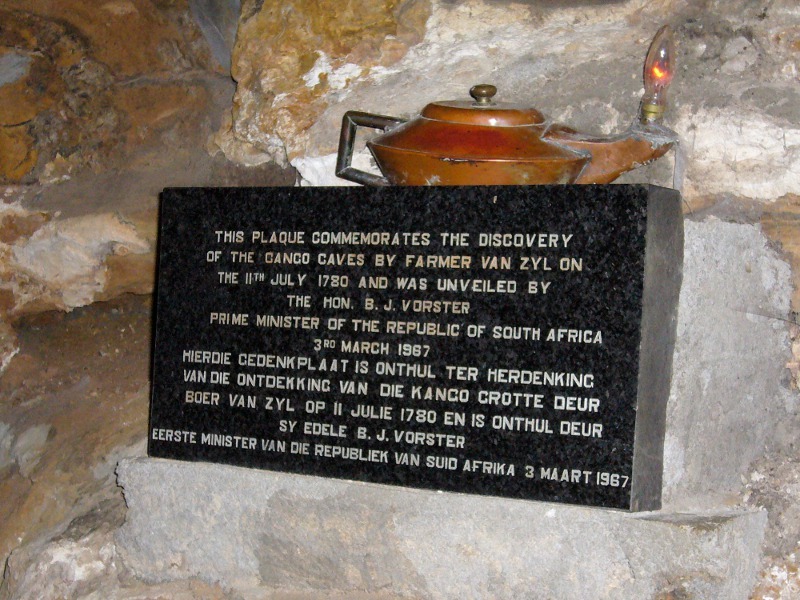 By late afternoon, we finally arrived at the Cape of Good Hope, the most south-western point on the African continent. This is where the clear blue sky meets the deep blue sea and where the air is so fresh, it brings a smile onto your face. Most tours would just do a brief photo stop here but for a more complete experience, you can hike up the terrain on the Scenic Walk for a better view. Head up the Scenic Walk for a better view at the Cape of Good Hope. 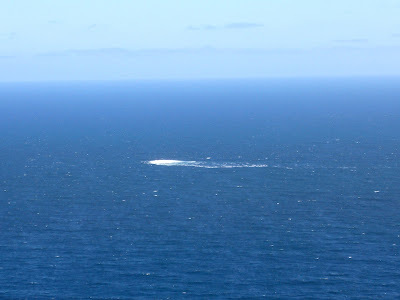 After the teaser at the Cape of Good Hope, we rounded the coast and reached Cape Point, the tip of the Cape Peninsula, some 60km south-west of Cape Town. 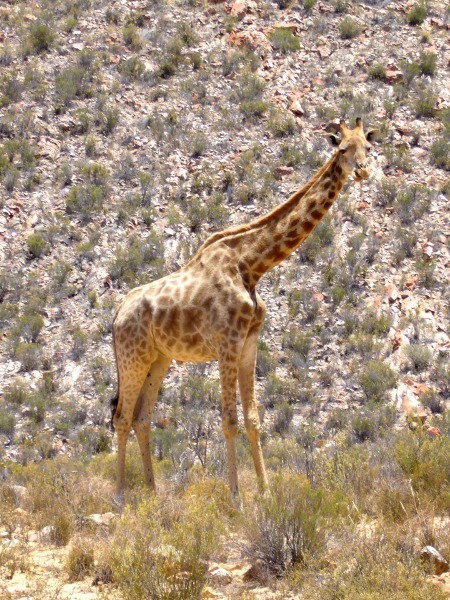 A nature reserve within the grounds of the Table Mountain National Park, its scenic beauty is not the only attraction here. Also known as the “Cape of Storms”, the lighthouse standing tall on the hilltop is a reminder of the many casualties its unpredictable shores have taken in its long maritime history. In 1857, the first lighthouse was completed at a height of 238m above sea level, but was subsequently moved lower as it was frequently obscured by clouds and fog. 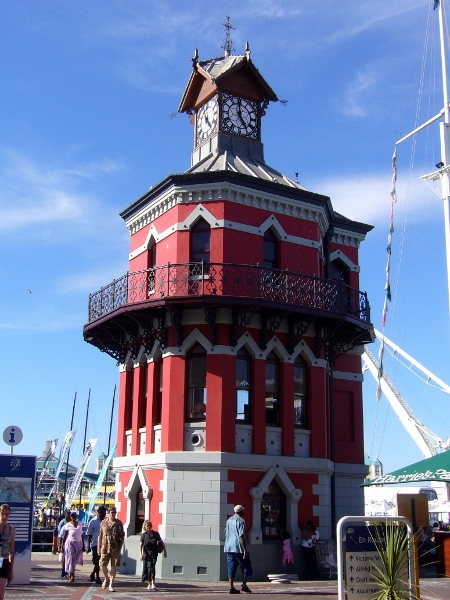 Its present location may only be 87m above sea level, but it does not diminish the fact that it is the most powerful lighthouse on the South African coast, with a range of 63km. The lighthouse at the top of the hill at Cape Point. 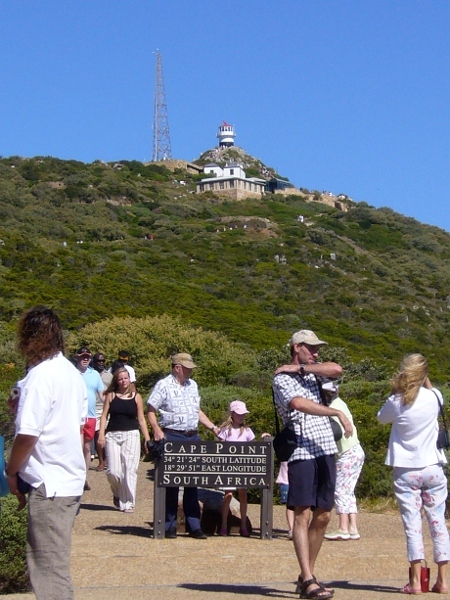 Cape of Good Hope, as seen from Cape Point. 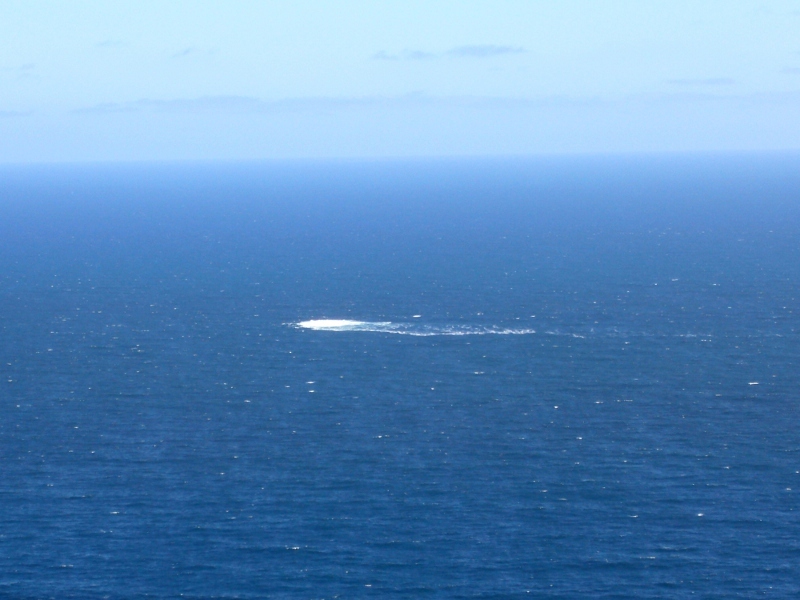 The bubble in the ocean that marks the point where the Indian Ocean and Atlantic Ocean meet. The view of Cape Town from a lookout spot on the way back from Cape Point. Enroute back to Cape Town, we stopped by Rhodes Memorial, located on the eastern slopes of Table Mountain. 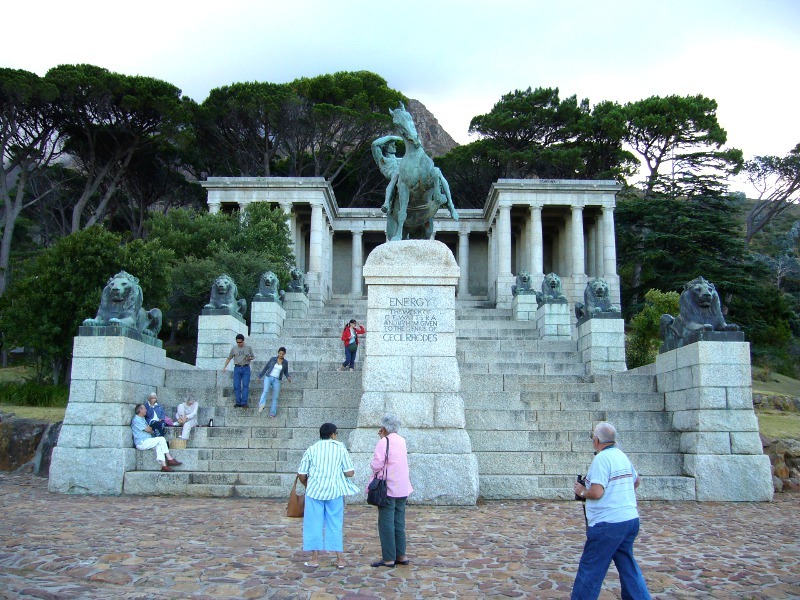 Built in remembrance of Cecil John Rhodes, a former prime minister and mining magnate, the granite memorial was designed after the arch at London’s Hyde Park Corner. DAY 3. 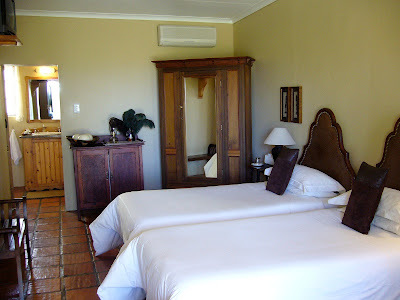 This is the day we embarked on our Garden Route tour! The Garden Route is a scenic route that traces the south eastern coast of South Africa with breathtaking views of mountains and valleys of the Western Cape. Running nearly 200km from the town of Mossel Bay (the official start of the Garden Route) to Storms River Mouth, it is typically a 3 to 4-day trip depending on the number of attractions or activities you want to see along the way. 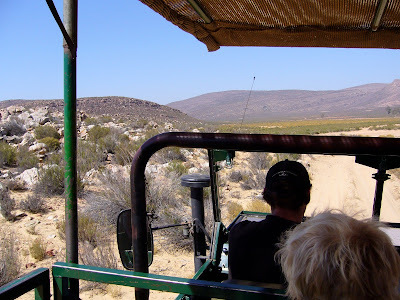 You can also do this tour as a self-drive option if you do not want to join a small-group tour like we did. We first stopped by Cango Caves in Klein Karoo, limestone caves that took a million years to form and are among the biggest stalagmite formations in the world. 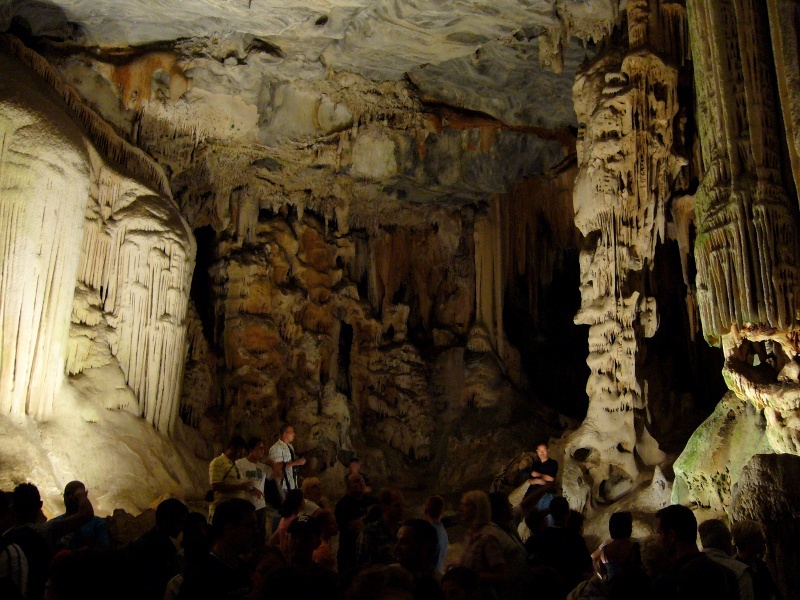 Although the full length of the caves stretch for about 4km, only about a quarter is opened to visitors, and accompanied by a tour guide no less. The caves are dimly lit for dramatic effect, but also to protect the sensitive limestone from light damage. Admiring the beauty of the cavern at Cango Caves. 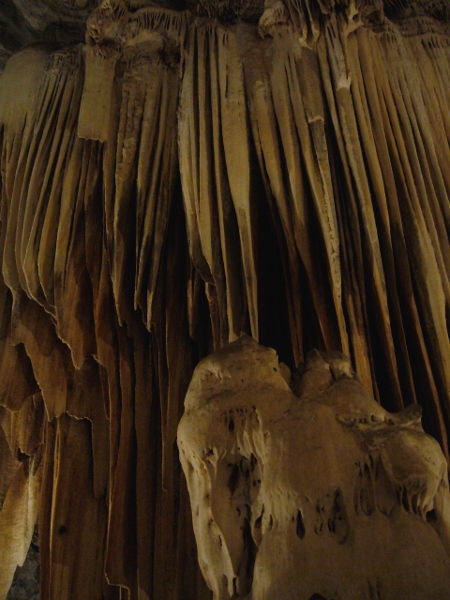 Stunning stalagmites hanging from the ceiling of the Cango Caves. A plaque commemorating the discovery of the Cango Caves. 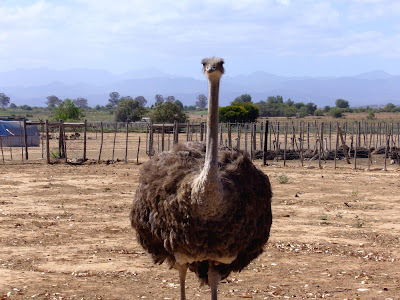 After huddling underground in the cold and clammy Cango Caves, the warmth of the sunshine at the Ostrich Farm we headed to next was a welcome change! Learn about ostriches in the small but neatly organized exhibition, hold an enormous ostrich egg with your two hands, or take a ride on the real thing. 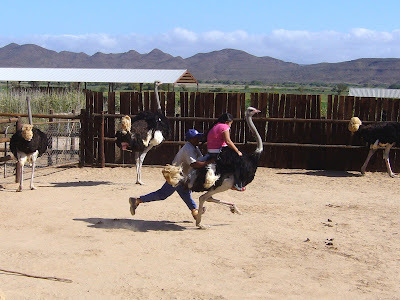 The challenge here is really to see how long you can stay on the ostrich, but do not worry if you are not up to it. 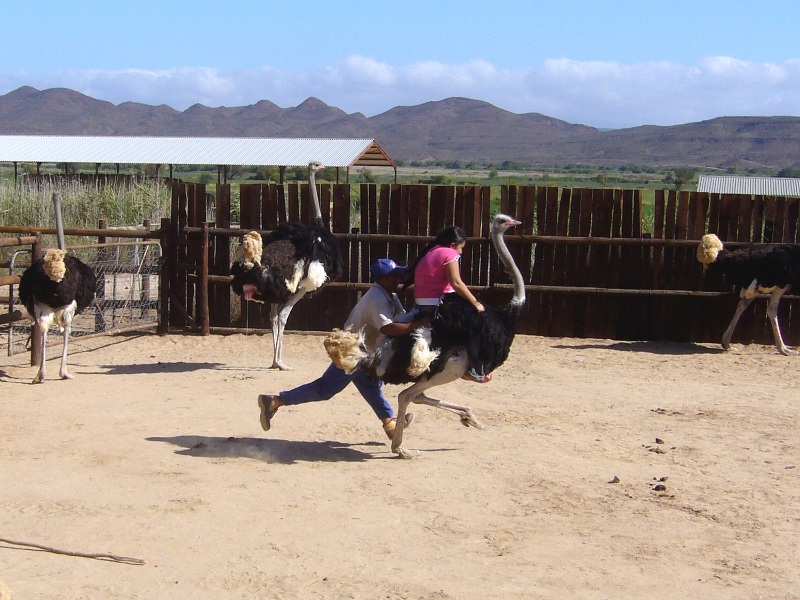 You can just pose for a picture on the ostrich like we did. By the time we were done at the Ostrich Farm, it was time to retire to our lodgings for the night, a guesthouse by the name of La Plume. A resort seemingly in the middle of nowhere, La Plume’s guestrooms are spread across the compound chalet-style and connected by stone footpaths all around. 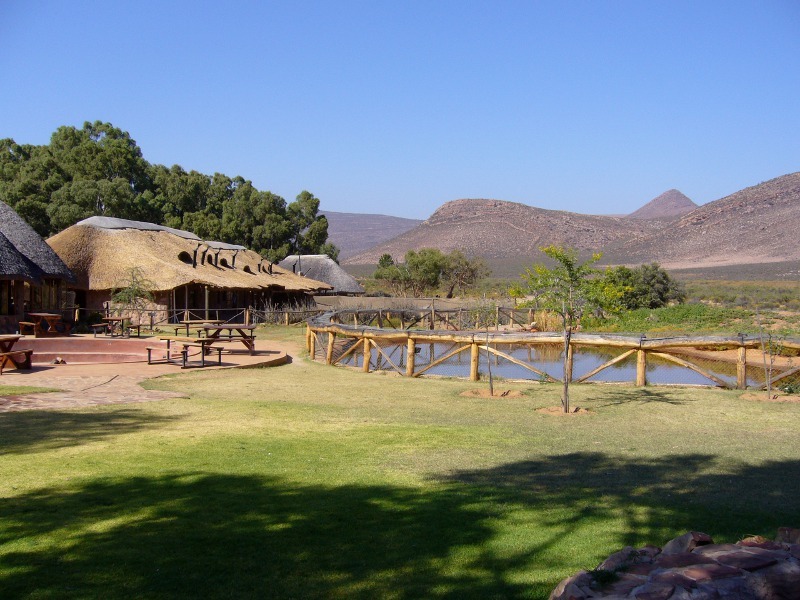 This was the perfect place to unwind after a long day on the road, with a welcome drink by the lawn, surrounded by tranquil surroundings, chirping birds and later, a dinner feast of ostrich meat. DAY 4. This tour never failed to surprise. 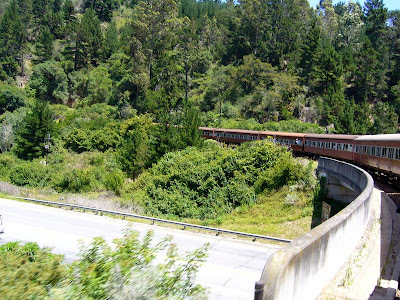 Instead of heading to our next destination by road, we would be taking the train today, and on a historic train no less. 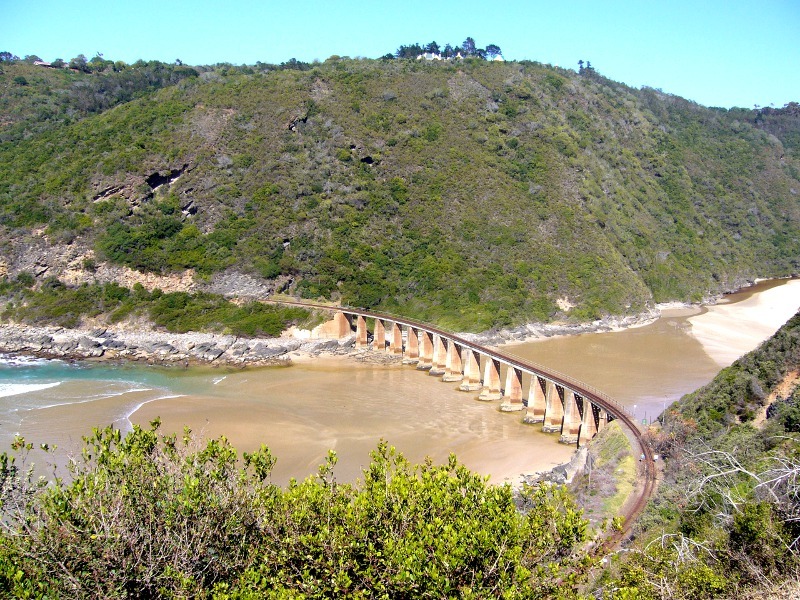 The Outeniqua Choo-Tjoe Train is a preserved coastal steam train that runs on the Outeniqua Preserves Railway Line from the town of George to Knysna. 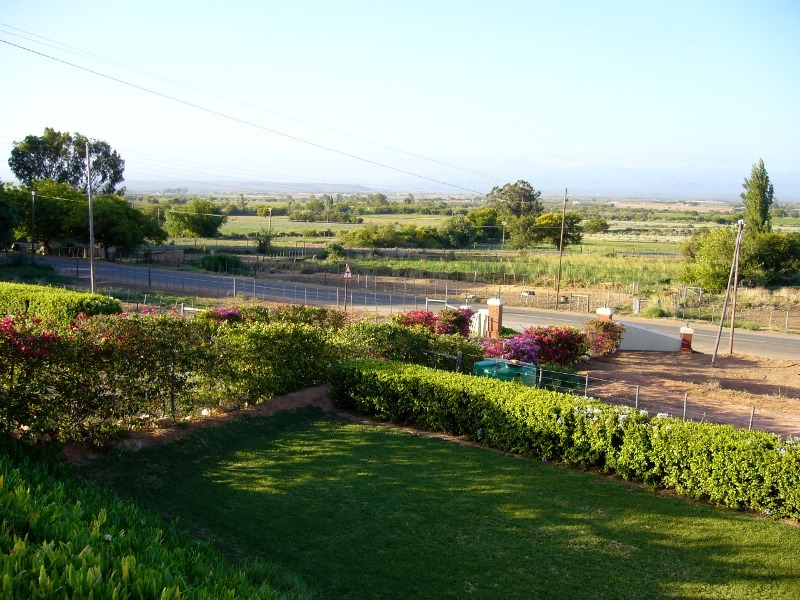 It follows the dramatic coastline of the Western Cape, offering views of gorgeous river plains and lush greenery as it trudges slowly and steadily along the train tracks. The Outeniqua Choo-Tjoe Train traversing through the coastline scenery. A bridge crossing on the Outeniqua Preserves Railway. 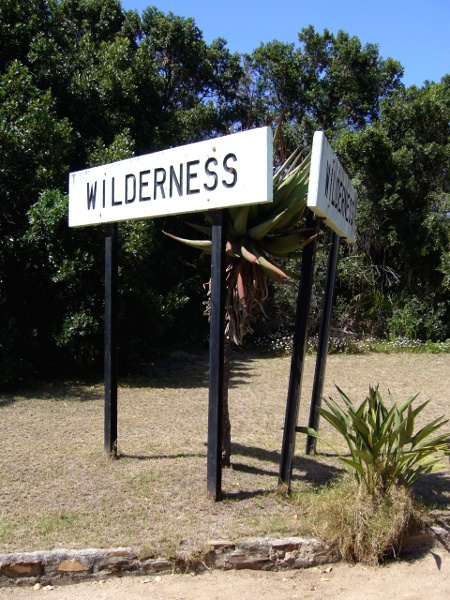 Making a brief stop at the town of Wilderness. Nothing soothes the mind like a good old train ride. We reached our destination feeling refreshed and eagerly anticipating our next adventure. 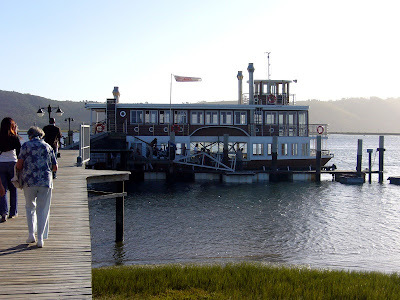 The beautiful town of Knysna is the end-point of the Outeniqua Choo-Tjoe and is where we were going to stay for our second night of our Garden Route tour. 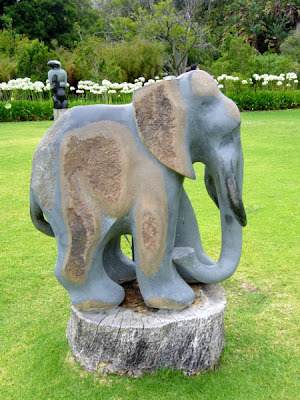 This historical seaside village 102km east of start-point Mossel Bay, is the hub of the Garden Route. 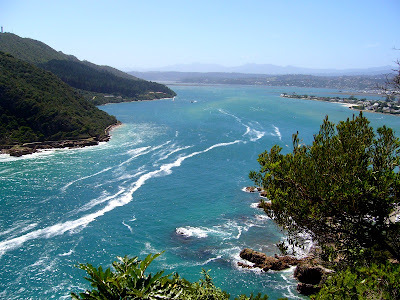 Although it does not have a seaside beach like many of its other counterparts, it has an impressive pair of rock formations called the Knysna Heads guarding the narrow mouth to the lagoon. And the lagoon was where we ended the day with a lovely sunset cruise and dinner aboard a paddle steamer. Our lagoon dinner cruise on board a paddle steamer. DAY 5. Today we turned around and began our return trip to Cape Town. But this is not the end of the fun. More spectacular views awaited us at Plettenberg Bay, a short ride east of Knysna. Named after the Governor Joachim von Plettenberg, it is a famous seaside resort today and the most glamorous one on the Garden Route too. With its beautiful beaches stretching all around the bay, it’s not difficult to see why. Back round the Outeniqua Pass we went, one of the seven passes through the mountains between George and Knysna, and as with all mountain passes, it was both an exhilarating and nauseating experience. Finally, we arrived at Mossel Bay, the start point of the Garden Route and the last stop of our 3-day tour. 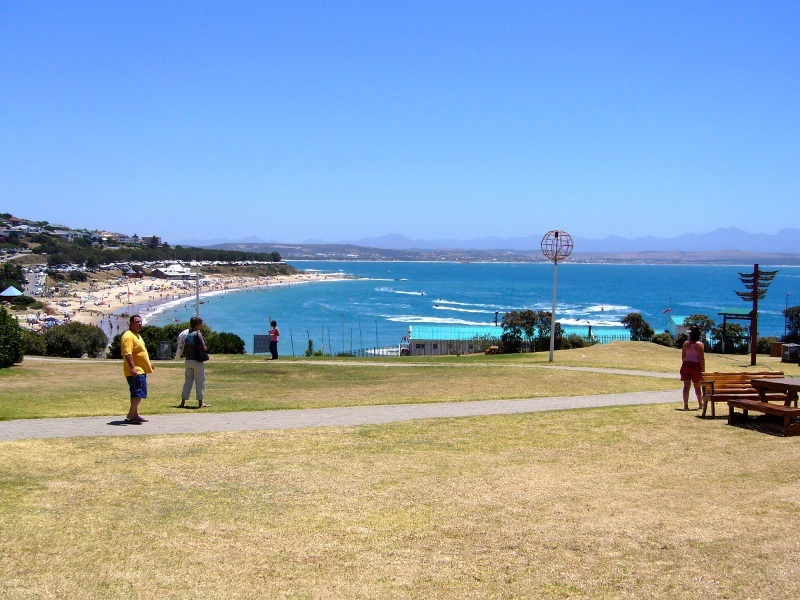 Mossel Bay is a mid-sized town 397km east of Cape Town and is named as such because of the huge quantities of mussels, oysters and lobsters once found here. This was also where the first European, Portuguese Bartholomeus Diaz, landed in 1488. 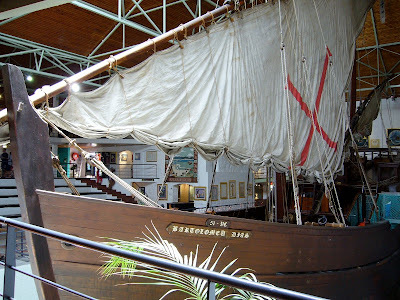 The town’s main attraction, the Diaz Museum Complex, documents all the related maritime history and even has a replica of the sailing ship that Diaz used in his journey in 1488. Just outside the maritime museum, a boot-shaped letterbox serves as a reminder of how 16th century sailors used to leave messages for other ships, by placing them in an old boot under a milkwood tree, which is now affectionately known as the Post Office Tree. A replica of Diaz’s sailing ship at the Diaz Museum Complex. 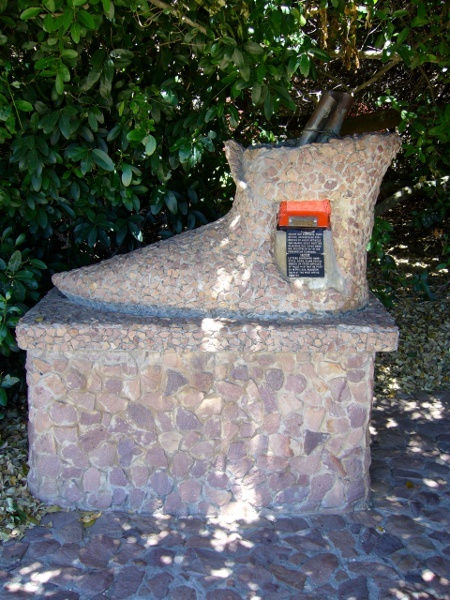 The letterbox built in the shape of an old boot. DAY 6. 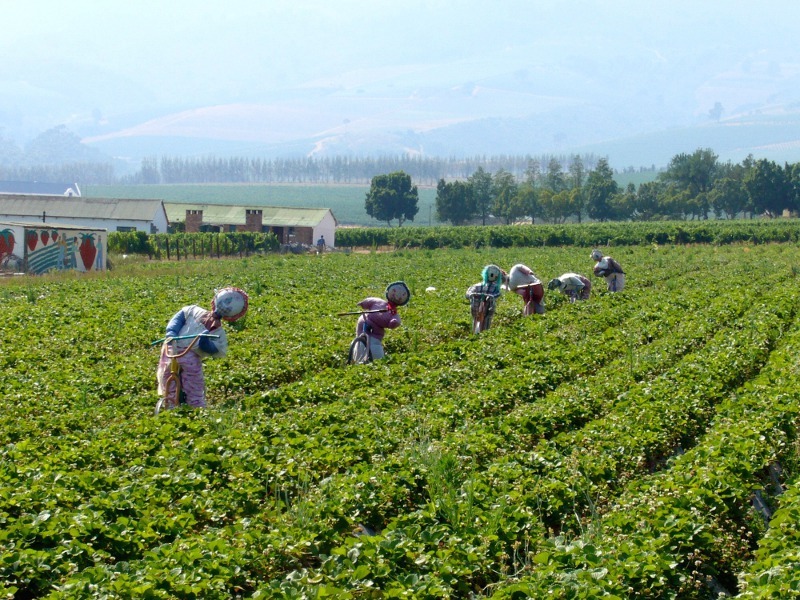 Back in Cape Town, there are numerous day activities to choose from too, and one of them is strawberry picking! This particular strawberry farm that we went to, Mooiberg Strawberry Farm, is a popular spot not just for their strawberries, but for their really cute scarecrows too! 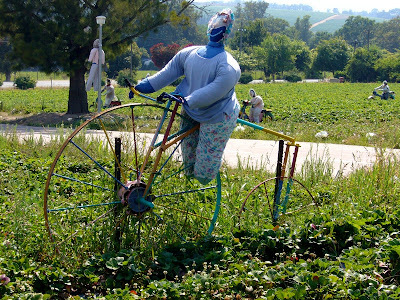 Forget about creepy scarecrows covered head to toe in black, the scarecrows here are fashionably dressed in cheery colours, with many “riding their bicycles” down the strawberry fields. Colourfully-dressed scarecrows lining the strawberry fields. Going round and round on the bicycle! 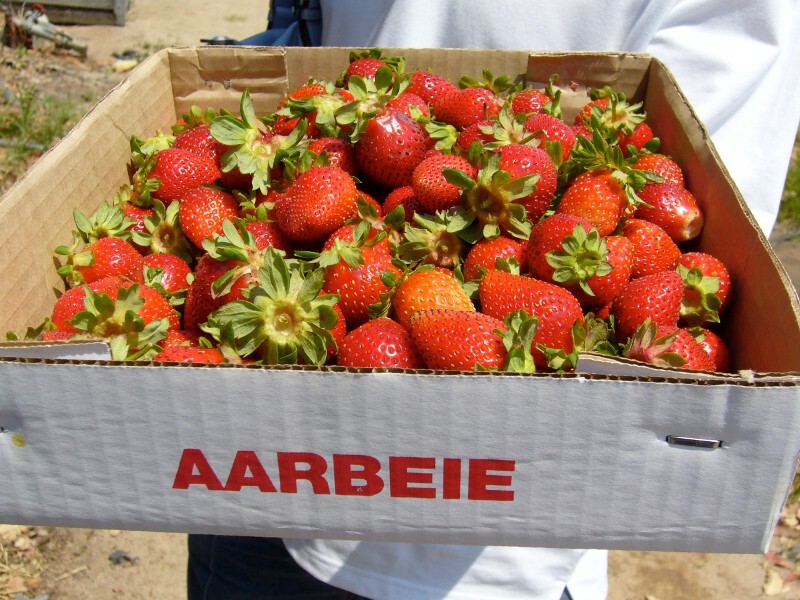 Our harvest of fresh, juicy strawberries! 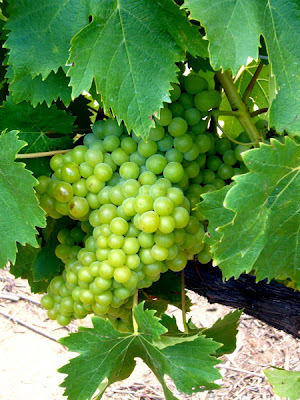 A visit to Cape Town cannot be considered complete without tasting the local wine. 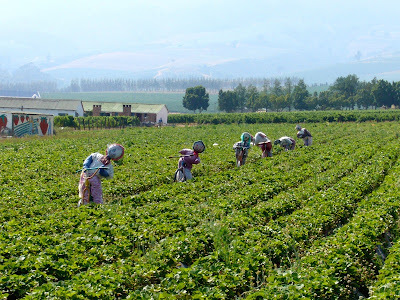 The South Africa wine industry stretches back to the 17th century and is the 9th largest in the world today, with over 200 wineries on the outskirts of Cape Town alone. Needless to say, this was where we headed to after a hearty lunch and healthy snack of strawberries. 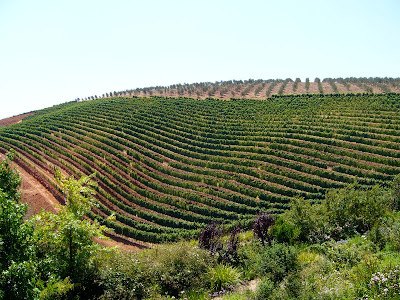 Wineries in Cape Town are built like mini-excursions on their own; you could take your time to taste the wine and lounge around, check out the exhibits on display or take a walk on their sprawling grounds. Even if you are not into wine, you can still enjoy a day out at the vineyard. 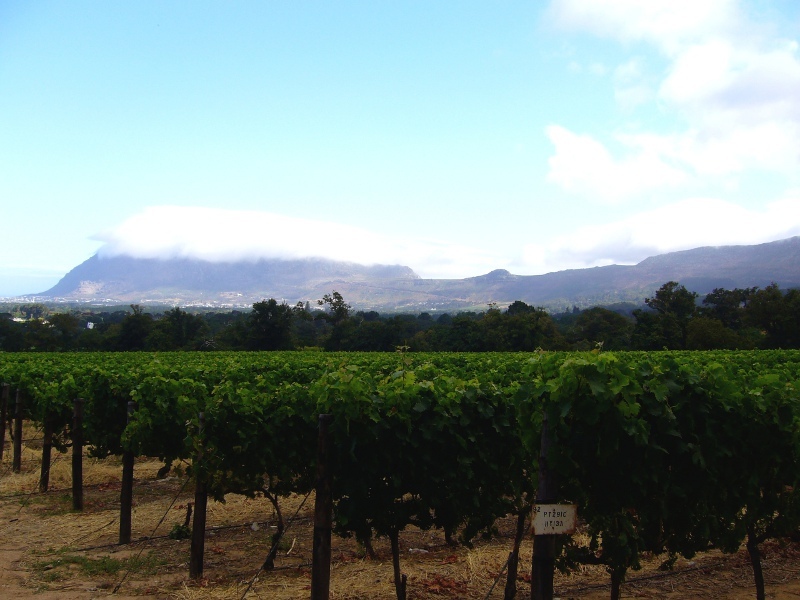 Of these, the oldest wine-growing region in South Africa is Constantia, located on the eastern slopes of Table Mountain. 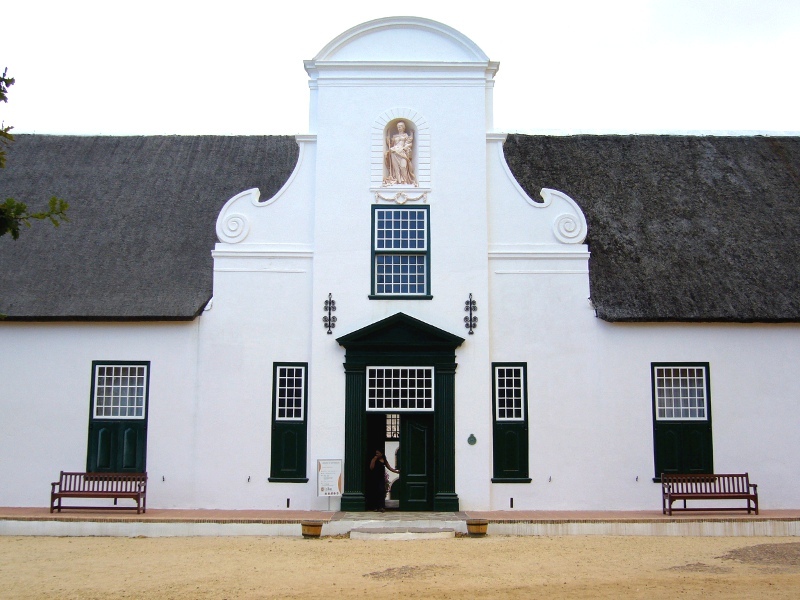 One of the grandest of the vineyards and homesteads is Groot Constantia. 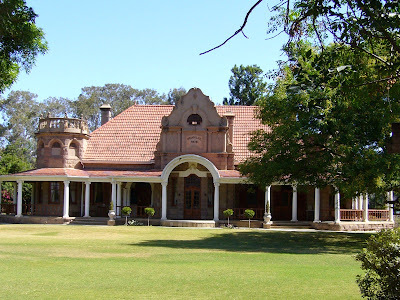 Its sprawling grounds are set against the backdrop of Table Mountain and its Manor House is a classic example of Cape Dutch architecture. With a location so charming, it was no wonder we had to pluck ourselves off the wine estate to drive back to Cape Town before it got dark. The Manor House at Groot Constantia, built in distinctive Cape Dutch style. The vineyards of Groot Constantia set against the backdrop of Table Mountain. Green, green grapes all ripe for the picking! DAY 7. Leaving the apartment at dawn today, we started the day early to drive out to the Aquila Private Game Reserve. This wildlife safari may not be as big and authentic as the popular ones, but it did offer us a glimpse of the African Big Five – the Buffalo, Elephant, Lion, Leopard and Rhinoceros. Ok, so we did not see all five, but we did manage to catch four of them and a few other herbivores. The entrance area to the Aquila Game Reserve. On the jeep, riding to the reserve grounds. 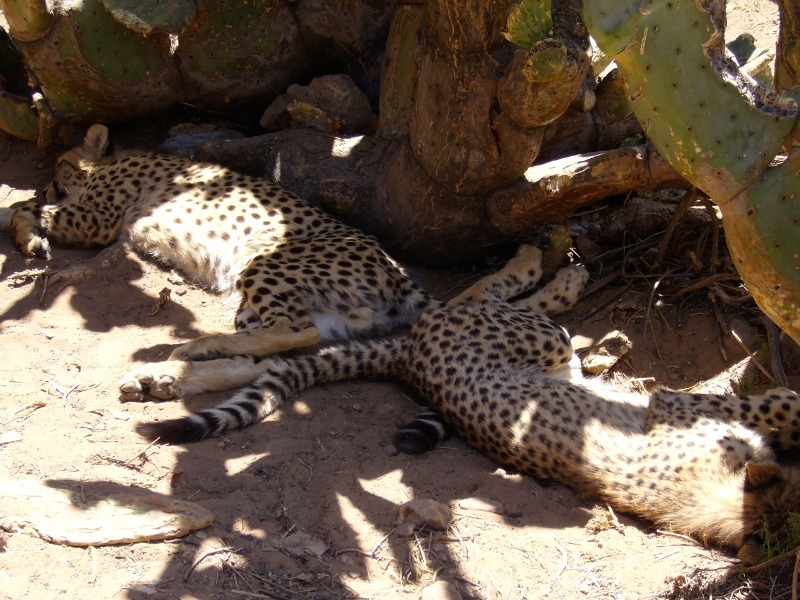 A pair of leopards taking an afternoon nap. 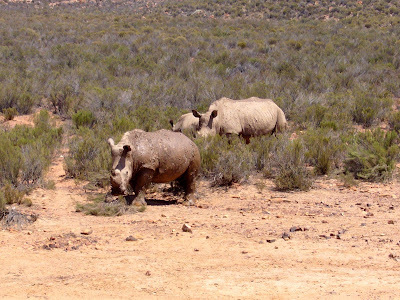 A mini herd of rhinoceros, one of Africa’s Big Five. The tall and gentle giraffe. DAY 8. 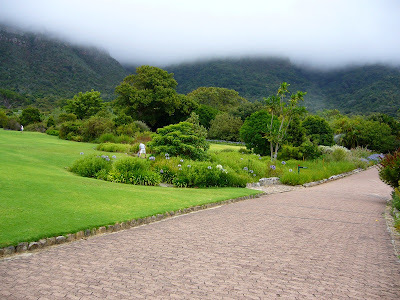 More stunning views awaited us today as we headed out to the Kirstenbosch Botanical Gardens. The lush grounds and cool temperatures of the gardens make it a perfect place for a relaxing stroll and a picnic on the lawn, which was exactly what we did. 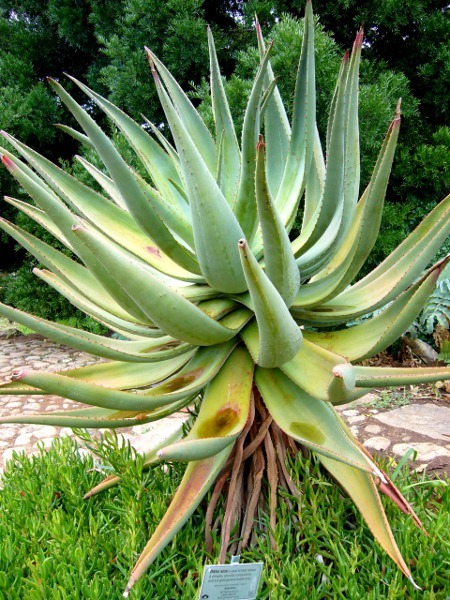 Sprawled over 500ha of land on the slopes of Table Mountain, the Kirstenbosch Botanical Gardens is the first botanic garden to earn a World Heritage status in 2004. 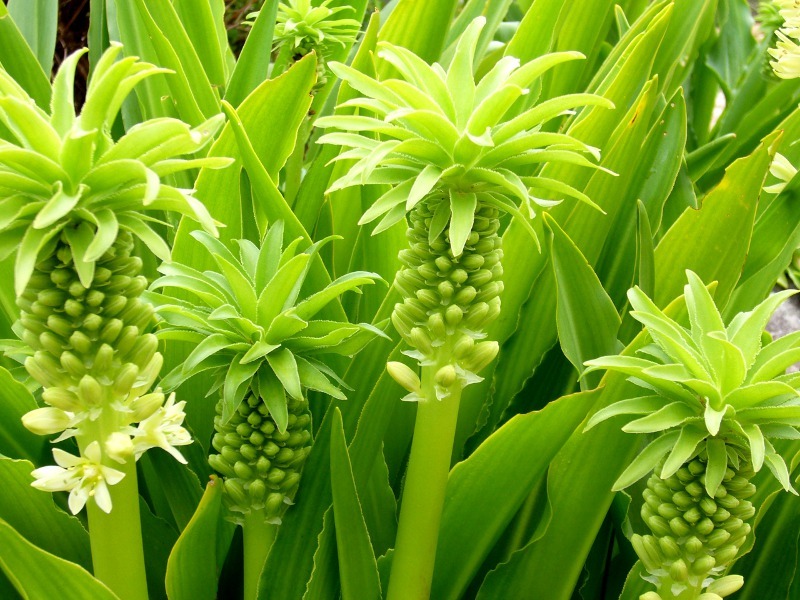 Indigenous plants make up a huge part of the collection, but it also features a special sculpture garden and delightful fragrance garden. 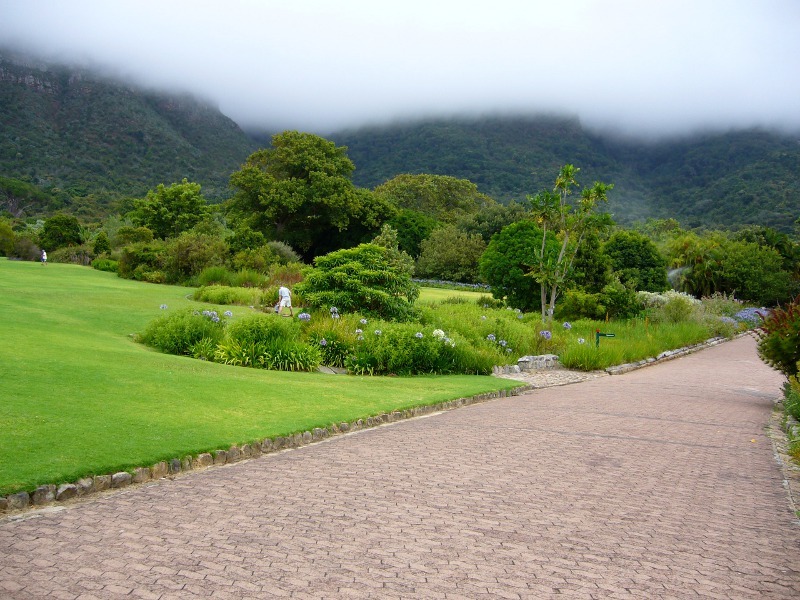 The brilliance of the place lies in the seamless transition from landscaped grounds to mountain vegetation, with the cloud cover occasionally rolling over the mountain top for an ethereal effect. A plant native to South Africa; the Bitter Aloe, a good general health tonic. DAY 9. Back in the city, it was time to do some requisite sightseeing. From the Nelson Mandela Gateway at the Waterfront, we embarked on a 12km ferry journey that took us to Robben Island, “home” to Nelson Mandela for nearly two decades. 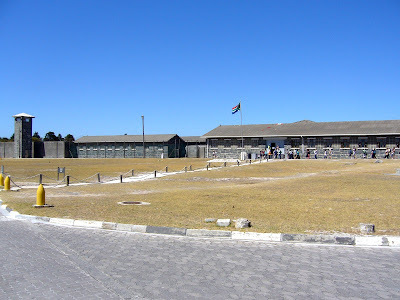 The Alcatraz of Cape Town, Robben Island was used as a prison compound from the 17th to 20th century and was the key site of South Africa’s struggle for liberation from apartheid. Today, it is a UNESCO World Heritage Site and a museum, open to visitors. 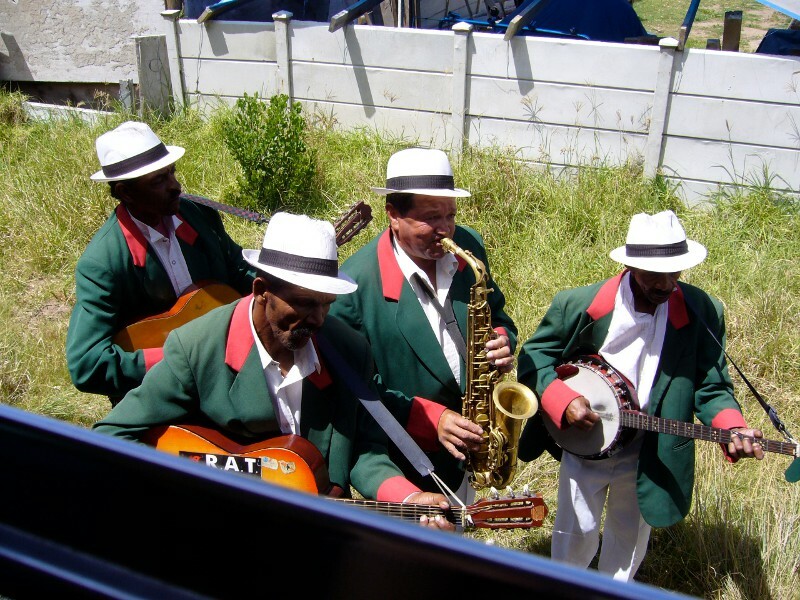 A guided tour around Robben Island includes a 45-minute bus ride around the island, a walk through the prison and a peek into Mandela’s cell, all hosted by a former inmate. The Robben Island prison complex. 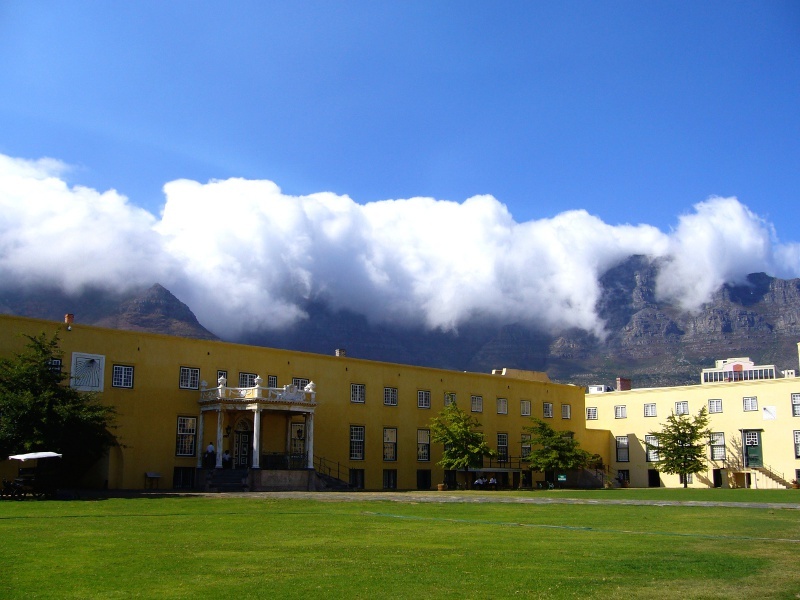 Another worthy attraction is the Castle of Good Hope. Built between 1666 and 1679 by the Dutch, the pentagon-shaped structure has never seen action in its 350 years of existence. It is also the oldest surviving building in South Africa and is now the headquarters for the Western Cape Military Command. Catch the ancient key ceremony held at the castle’s main gate at 10am on weekdays, or watch the Changing of the Guard ceremony at 12pm. The Castle of Good Hope, with the famous Table Cloth rolling over Table Mountain behind it. DAY 10. Today we bade farewell to Cape Town. As sad as we were about leaving this nature wonderland, we were also rather homesick and craving for some local food. 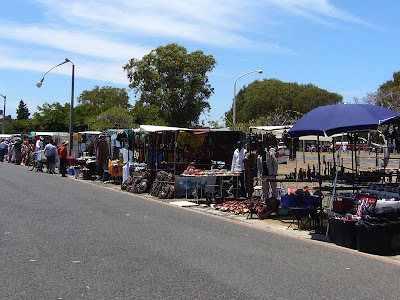 Nevertheless, we could not leave Cape Town empty handed, so we headed to Greenpoint Stadium, where a flea market springs up every weekend selling all sorts of handicrafts. Our precious souvenirs procured, we said our thanks and goodbyes to our superb hosts and left Cape Town with many new and wonderful memories! Stalls selling handicrafts at a flea market at Greenpoint Stadium. * The views and opinions expressed in this article are that of the writer and do not represent the views of New Shan Travel.